Skip was found in the park...he kept jumping his owner's fence. 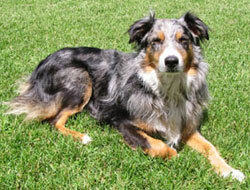 She adopted him from the Martinez shelter, but couldn't keep him in her yard and gave him up to NorCal Aussie Rescue. Here is a letter from Skip's Mom. Just wanted to update you on Skip. I attended two CPE Agility trials these past two weekends and couldn't be happier. He qualified in all his Level 1 games, and has only one more standard class in order to finish the entire level. We were even able to qualify in some Level 2 games the following weekend. Skip is such an incredible dog, I feel lucky to have him. I don't think I could have ended up with a better dog even if I was given the chance to take the pick of a litter. The first day of the trial we had to wait over seven hours - yes, seven - before his first class. Sometimes it just happens that way at trials. He never caused a fuss about the waiting, but was happy to lay down and chew his bone, or wait patiently in his crate. 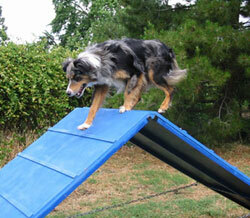 He has been amazing in agility. I showed him how to do the teeter once, and that was it. It was the same with all the other obstacles, dog walk, A-frame, tunnels and chutes - nothing fazes him. When we go out to train, he races ahead and will do several obstacles - for the fun of it I can only assume - before I catch up with him. He really likes the tunnel and the dog walk. He'll even try to run the obstacles when my sister's dog is working. Pretty funny seeing two dogs, one small and one big on the teeter at the same time. Sometimes when I am trying to close up the tunnel to put it away, I have to tell him to get out, please. He's running through it as I'm closing it up! I even saw him do the teeter backwards, jumping up on the high end and riding it down, wagging his stump as if he'd done something great. Added to that, he travels in the car like a champ. Right after he jumps in the van, he curls up on the seat and settles in for a snooze. I am so glad that there are rescue organizations like yours to help those dogs, that through no one's fault just weren't in the right situation. Skip is a perfect example. He just doesn't like being alone. Now that he's not, the great things about him get to shine like stars.